"In compliance with the will of his father-in-law, the Rev. J. T. F. Hurt, his wife, and their issue - five sons and three daughters - assumed by Royal sign manual, 15 Sept., 1827, the surname of Wolley only, and also the arms of Wolley. He died in November, 1877, and was succeeded by his third son, Charles, born 21 March, 1826, now the Rev. Charles Wolley-Dod, of Edge Hall, Malpas, co. Chester, whose wife was the granddaughter of T. C. Dod, Esq., of Edge Hall, whose surname he has since assumed. He has had issue eight sons and three daughters, the eldest and heir being Francis, born 3 May, 1854, married 1887, to Annette, daughter of F. Clark, Esq., of Aldridge Lodge, co. Stafford, by whom there is issue, John Cadogan, Charles, and a daughter." The change of surname referred to above was published in the London Gazette. Adam Wolley's name appears frequently in early 19th century issues and in 1821 he is listed as the heir to his late brother, John. See Matlock Names in the London Gazette, 1801 - 1840. Also see 1886 re Adam Wolley's Will and 1896 re Rev. Wolley-Dod. 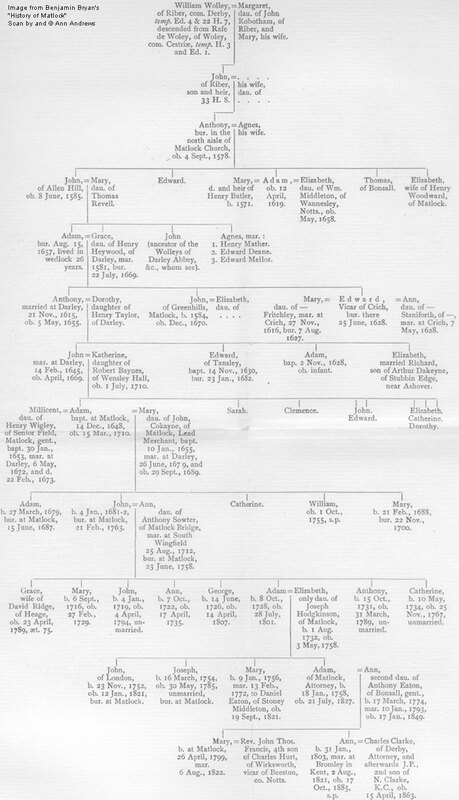 Generation 4 shows most of the siblings of John Wolley, the first Wolley to live at Allen Hill on Matlock Bank, but does not include Adam Wolley of Riber Hall. He is shown on the Pedigree of Wolley of Riber. Generation 4. A nineteenth century descendant of Thomas Wolley of Bonsall married George Allen. Her son owned Riber Hall and she was the last Wolley to die at there. See Matlock : Riber Hall engraving. Generation 5. There is a misprint in the information about Adam Wolley and his wife Grace who died in 1657 and 1669 respectively. They were married for 76 years, not 26 as printed. Generation 8. Whilst not all of the children of John and Katherine have been found in Matlock's Parish Register, Sarah was christened on 24 Mar 1647, Elizabeth on 18 May 1656, Catherine on 4 Aug 1658 and Dorothy on 23 July 1663. Their son John was christened on 21 Jan 1658. Of these both John and Katherine are known to have married; Katherine's husband was Adam Walker (marriage bond 23 Feb 1682 at Darley) - see Pre-1858 Wills, Surnames W: Wolley Adam 1711. Generation 9. Catherine daur of Adam	and Mary Wolley was christened at Matlock on 5 Mar 1684. She married George Bown, a baker, (marriage bond dated 25 May 1708) at South Wingfield and they had several children. She was buried at Matlock on 17 Mar 1742 (see bur) and her husband was buried on 27 Jan 1747 (see bur). See Pre-1858 Wills, Surnames W: Wolley Adam 1711. Generation 10. Grace Wooley (no abode given) married David Ridge at Duffield on 21 Nov 1754 (from Phillimore). A marriage bond for the couple, dated 20 Nov 1754, states that they were both over 30, he was a yeoman and confirms that she was of the parish of Matlock. Generation 11. Adam Wolley of Matlock Bath, who died in 1827, had a large collection of manuscripts in fifty three folio volumes for a projected county history of Derbyshire that were donated to the British Museum in his Will (see About the Wolley Manuscripts, elsewhere on this web site). Also see both his burial and his MI. Generation 12. Whilst researching Charles Clarke, the son-in-law of Adam Wolley, the web mistress came across three different dates for his death. Bryan says it was 15 Apr 1863 as shown above and in his book. The MI transcripts on this site say it was the 13th April and "The Derby Mercury", publishing the announcement of his death on the Wednesday 15th Apr stated he died on Sunday 12th April. His Will was proved at the Principal Registry and confirms the date of death as 13 Apr 1863. Wolley Manuscripts Derbyshire A major collection of pre 1828 documents. The Wolley Manuscripts, Matlock - more detailed, with a series of documents relating to the WOLLEY family. Hatches, Matches & Dispatches Find the WOLLEY family in Matlock's parish registers. Matlock & Matlock Bath's Memorial Inscriptions, Surnames W.
Matlock & Matlock Bath Wills Calendar, includes Wills for the WOLLEY family. See Pre-1858 Wills, Surnames W.
Coat of Arms: Description of WOLLEY arms. Image produced from a copy of the pedigree in the collection of, provided by and © Ann Andrews. Written and researched by and © Ann Andrews.